Chick-fil-A at Hapeville Dwarf House was first opened by Truetty Cathy in 1946 as The Dwarf Grill. 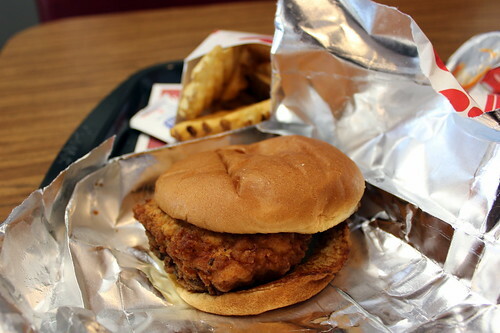 It was here that Cathy invented the Chick-fil-A's boneless breast of chicken sandwich. In 1961 after finding a pressure-fryer that could cook the chicken sandwich in the same amount of time to cook a fast food hamburger, Cathy registered the name Chick-fil-A, Inc. and starting with a restaurant at a mall in suburban Atlanta in 1967 began to expand throughout the region. Today there are more than 1600 locations across 38 states. The Hapeville Dwarf House is one of 11 Dwarf House locations around Atlanta, all of which, unlike other Chick-fil-a locations, offer a full-service menu in addition to fast-food service. It features an extra small-sized front door and a motorized display of the seven dwarfs in the back.